Please see below for important information about Risk Assessment, Investments and Reserves and the Structure and Future of the Executive. Bookings are coming in well for this year’s Conference which is being held from Tuesday, 26th July to Thursday, 28th July 2016. Although the deadline given in the Application Form leaflet is 30th April we can still accept bookings, so please do not hesitate to apply. 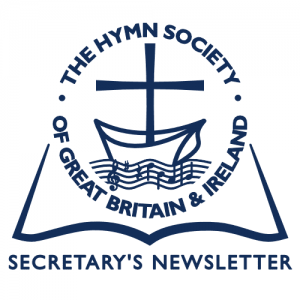 We have an excellent and varied line-up of six lecturers, plus the ever popular Short Metre Session where Hymn Society members share their views on a hymn-related topic of their choice; there has been a lot of interest in this and it is already fully subscribed. Our Festival of Hymns is being held in the atmospheric surroundings of St Salvator’s Chapel, exuding centuries of history. The cost this year is just £240.00 and there are a limited number of Bursaries still available for those who may need assistance. Booking Forms are available online or from the Secretary, to whom requests for Bursaries should also be sent. The first Conference for which I was responsible was in Edinburgh in 2004. Memories flooded back a few weeks ago when we were privileged to attend an organ recital, given by our member Dr John Kitchen, in the Parish Church of St Kentigern, Crosthwaite; the present building dating back to the early 16th century and which, (excluding Carlisle Cathedral), features the largest organ in Cumbria. Amongst his many other commitments, John is Director of Music at Old St Paul’s Episcopal Church, Edinburgh, where he became organist in 1988. At our 2004 Conference we had an exceptionally fine Festival of Hymns in the Kirk of the Canongate, Edinburgh: John Kitchen was the organist, Charles Robertson (then minister of the Kirk of the Canongate), the commentator, and Ian McCrorie, the conductor. The final hymn in the Festival was How shall I sing that majesty to COE FEN which also featured in our 2015 Cambridge International Hymn Festival last year. As far back as 2011, the Executive Committee resolved to prepare a short statement of policy regarding the reserves and investments of the Society. The following year, 2012, changes to the Constitution were approved. These two combined and expanded into a Reserves, Investments, Risk Assessment & Constitutional Review for which a sub-committee was established. This, in turn, also considered concerns raised about the election processes of the Society. The result is the enclosed paper which contains important proposals to be brought to our forthcoming AGM in St Andrews in July. The paper falls into three parts. The first two are Risk Assessment and Investment and Reserves Policies. The third comprises proposals for restructuring both the Executive and the way in which we conduct elections, allowing for more information about nominees and the opportunity for wider participation in the voting process by members. Because of the constraints of time, the proposals will be presented as a whole for either acceptance or rejection. They do not in themselves comprise a revised Constitution; this is in process of formulation and may be presented concurrently or at a future AGM. Our member Revd Matthew Prevett was ordained from Westminster College, Cambridge, to St Andrews URC, Monkseaton, Whitley Bay on 26th September 2015. His first degree was in music from Durham University and he has recently received a Ph.D. in association with the University of Wales Trinity Saint David (Lampeter). We offer him our congratulations, wishing him a fruitful ministry and that his congregation will be enriched with much good hymn singing! Our member, Dr Peter Horton who is Deputy Librarian (Reference and Research) at the Royal College of Music (RCM), has reminded us of the extensive hymnody collections at the RCM. These include the Maurice Frost and John Wilson collections, as well as early volumes from the RSCM collections, also items from the main RCM collection itself. There is also a collection of literature and hymn books owned by The Hymn Society and papers relating to the compilation of Hymns for Church and School. The Hymn Society collection was deposited during John Wilson’s lifetime but nowadays is rarely if ever consulted! I recently received, from our member Geoffrey Wrayford, a copy of Newsletter 79 (October 2015) by the Sabine Baring-Gould Appreciation Society. One article, The Mystery of ‘Lew Trenchard’, addresses the relationship between Baring-Gould and Ralph Vaughan Williams. LEW TRENCHARD was the second of two tunes set to Gentle Jesus, meek and mild (no 591, English Hymnal 1906). It was one of the English Traditional Melodies collected by Vaughan Williams and there is an apparent association between this tune and Sabine Baring-Gould. The author of the article, Martin Graebe, an acknowledged expert in folk song and on Baring-Gould, has been trying to trace an original of the folk tune for many years, but without success. Vaughan Williams and Baring-Gould, as well as having connections through the 1906 English Hymnal (Baring-Gould contributed five hymns, is listed as translator of another, and composer of the tune EUDOXIA), also collaborated over Church Songs (1911 and 1912), now largely forgotten and not listed in most accounts of Vaughan Williams’s work. This is a download by Americans Debby Kerner & Ernie Rettino, best known as the creators of the characters from the Psalty the Singing Psalm Book in the Kids’ Praise! series of Christian children’s musical albums. Discover “Psalty’s Hymnological Adventure Through Time”!